Situated in Chonburi, Central Place Hotel Pattaya lies close to one of the renowned tourist sites - Jomtien Beach. The hotel offers wireless internet access for the convenience of guests. In addition, guests are provided with an array of amenities, including 24-hour room service, airport pick-up/drop, tour desk, laundry and parking The on-site restaurant, named Haveli, serves a range of delicious Indian, Thai and Russian dishes to guests. Moreover, the on-site bar offers an array of wines and spirits in a pleasing ambience. Just 2 km from the hotel lies Indian by Nature restaurant, which dishes out sumptuous Indian delicacies. 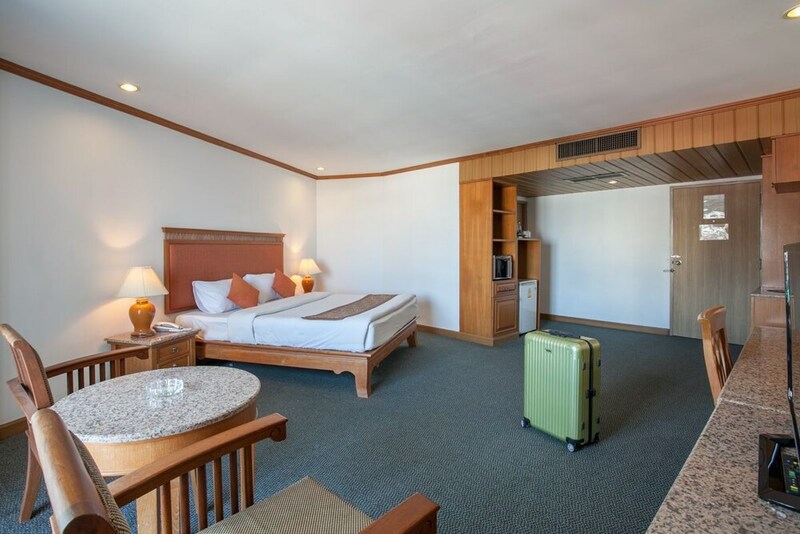 Central Place Hotel Pattaya features well-ventilated rooms that have a contemporary decor and are classified into Deluxe and Super Deluxe categories. Modern amenities like LCD TV, intercom, safe deposit box, mini bar, tea/coffee maker and Wi-Fi are available in all rooms. En suite baths feature modern fixtures and necessary toiletries. Tourists can indulge in various beach activities at Pattaya Beach or spend moments of repose at the nearby Wat Chai Mongkhon. Deal Applied: MMTOFFM9A. You Get Flat INR 303.0 OFF! Deal Applied: MMTOFFM9A. You Get Flat INR 373.0 OFF! Deal Applied: MMTOFFM9A. You Get Flat INR 338.0 OFF! Deal Applied: MMTOFFM9A. You Get Flat INR 419.0 OFF! Deal Applied: MMTOFFM9A. You Get Flat INR 349.0 OFF! Deal Applied: MMTOFFM9A. You Get Flat INR 396.0 OFF! Deal Applied: MMTOFFM9A. You Get Flat INR 466.0 OFF! A terrible experience. I was very shocked to be kept original passport to hotel authority. I was afraid of unseen casualty being happened. And it comes true at the time of check-out. They collected me a new towel and h arrayed for an hour. Not good housekeeping. No proper room service. Untidy rooms. Water missing from the wash-room. Very good location and room is so good, good staff and everything is good. No one should book this hotel. Washroom smell in the hotel. Waist of money to book this hotel. No water available in bathroom, no room service, no response from reception only they want money. I lost some of my stuff in 1 day no one come in my when I was there after I drop the key on reception and we go for shopping when we come back I collect key from reception but when we enter the room every think is same but we miss the stuff I say at reception but no response. No one care about us in my booking but I let then. Thief staff and owner. Dirty room, no cleanliness ever, worst experience at last I leave the hotel and take another hotel. Lost of money and with bad experience. Even roads of Thailand is more cleaner than this room. No room service no water bottle no towel nothing service even I request for room clean they say no service. I clean my self room and mop it. I didn't pay to MakeMyTrip for the service. The stuff is not supportive they are ready to fight and they threatened me stay or leave no money return. The staff treat me on the name of police. I have the service and staff and no clean room at night no water in bathroom i just used drinking water bottle in toilet. Location is too good. You can find lots of Indian restaurant near the hotel. Also beach and walking street is closed by. Very near to walking street by walk just 8 minutes, massage parlous in front of hotel. Very near by main attraction walking street 8 min walking distance many India restaurants near this hotel. Don't think twice, its location is perfect, every thing at walking distance, good and friendly staff, clean hotel with all facilities at cheap price, just go for it. It was good, I spent 3 days in this hotel with my friends for enjoyment. Not bad, I spent 3 days in this hotel with friends. Good hotel and good location. And friendly staff. Location was too good. I love the place. Service, I love the most. And everything was too good. And I am happy. Thank you. I was very much happy. I have no problem with anything. Thank you. Good hotel, friendly staff and food was au sum. If you are an indian this hotel is for you. Good food quality and taste you will find here. Must try dish allow peak plan the also if you wan have that massage then lady named pepsi is their, she is very friendly. Over all good experience with this hotel. Overall OK but can not say good. Very noise location and not any communication nearby. The staff are thief. They stolen cash from our bag. Conveniently located near restaurants and walking street. The Tez palace is short of support staff. Located just next to walking street, nice staff. Value for money! Would have got nothing more than this for the prices I have paid.